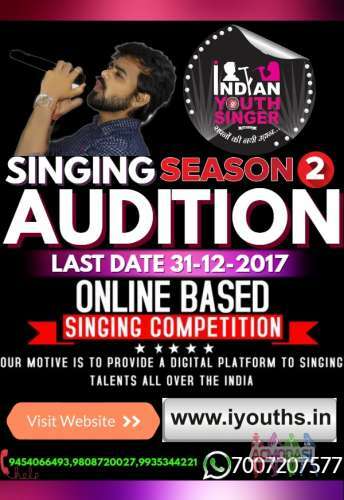 INDIA'S FIRST ONLINE BASED SINGING COMPETITION ONCE AGAIN ANNOUNCED FOR INDIAN YOUTH SINGER SEASON 2. A NEW ONLINE MUSICAL COMPETITION HAS BEEN ARRANGED OR ORGANIZED BY “SRI OM SRI MUSICAL DISCOVERY SOCIETY” TO ALL OUR LOVERS. IF YOU HAVE EXTRA TALENT ON YOUR SINGING THEN ITS A BIG CHANCE TO SHOW YOUR VOICE TO THE WHOLE WORLD. THIS IS ONLINE COMPETITION SO THE SHOW WILL NOT BROADCAST ON ANY TELEVISION CHANNEL. THE VIDEOS WILL BE PROMOTED ON OUR WEBSITES, YOUTUBE, AND OTHER SOCIAL MEDIA PLATFORM. REGISTRATION WILL BE BASED ONLY AN ONLINE WITHIN THE ALLOWED TIME PERIOD. THIS IS AN ONLINE SOLO MUSIC COMPETITION SO EACH ENROLLED PARTICIPANT WILL REQUIRE TO BE SENDING THEIR GOOD QUALITY SELF RECORDED VIDEO. Looking for aspiring female models for the upcoming calendar projects for the new year. Models who are interested for being poster girls can also apply.